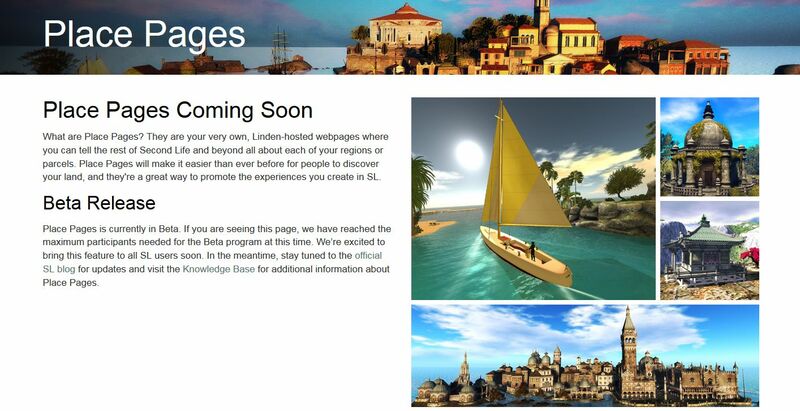 On January 11th, 2017, the Lab announced a new beta programme – Second Life Places. In essence this allows region and parcel owners to create a web browsable page for their location(s) in-world where they can be shared through blogs, websites, etc. Included with each page are buttons to allow visitors to the page to launch their viewer and teleport directly to your location (assuming they are Second Life users – if not, they’ll have to sign-up via the provided link to the main sign-up process). Visiting the Places home page – note you may have to log-in to it. Hovering the mouse pointer over your name (top right of the page) and selecting My Places from the displayed drop down – this will list all of your parcels and regions. You can then select those you wish to edit, and follow the instructions in the Knowledge Base article. Note that A Places page for a parcel can also be “hidden” at any time by unchecking Show Place in Search in the About Land window, while all Places pages for a region, regardless of parcel settings, can be hidden by checking World > Region/Estate > Region > Block Land Show in Search. Within the pages are options to embed image slide shows, machinima videos and include social media buttons to Facebook, Twitter, Google+ for those wishing to use them, as well as basic information on the location itself. There is also the ability to include a 360-snaphot banner / hero image, and to include links to the Places pages for locations / venues within the current location. For example, Loki Eliot’s Escapades Places page includes links to the Places pages for venues with his Escapades island, as shown below. All of which make the pages somewhat flexible. And while they are fairly basic at present, they could evolve into exceptionally useful items and make the L$30 a week search listing fee more than worthwhile. From the pkaces home oage, I would expect to be able to see places and search for place pages by (partial) name to make this useful. And it should be linked to the menu of pages on the SL home page and links at the bottom there. I was expecting the same, vis. searching. I assume that capabilities like that will be made available once there is a critical mass of places to search. While, I would also hope, happens sooner rather than later.